As part of my (and my hubby’s) new budget, we’ve cut eating out from our life for a couple of months in order to try to pay down a big chunk of our car loan. As a result, I don’t get to go have my favorite pizza at The Rock, and I’ve been craving it for about a week. Today I decided to do something about it and made my own version from scratch. I started with homemade crust, then I made a quick alfredo sauce and loaded up the toppings. I finished the whole pie off with a drizzle of the alfredo and some fresh mozzarella cheese. The great part is that from this one batch of dough, I got two good-sized pizzas. I let my kids top theirs however they wanted…which ended up being sauce, pineapple and mushrooms (no cheese…they are bizarre children). And then made a fantastically grown up pizza for me and my honey. Way better than wrangling my kids while waiting for a table and paying over $60 for a meal out as a family. I have included the directions for the dough without a bread machine. If you have a machine, just set it to dough cycle, add your ingredients in the order stated for your machine (3 1/2 cups flour) and let her rip. Once my dough was finished, I put it in the fridge in an oiled bag until I was ready to use it (up to 36 hours). Removed it from the fridge to the counter 30 minutes before rolling it out to come to room temperature. You can also make this dough ahead of time, and freeze it for up to 6 months. Just allow it to fully defrost when you want to use it. Turn dough out onto a clean, well floured surface, and knead in more flour until the dough is no longer sticky. Place the dough into a well oiled bowl, and cover with a cloth. Let the dough rise until double; this should take about 1 hour. Punch down the dough, and form a tight ball. Allow the dough to relax for a minute before rolling out. Poke holes thru pizza dough (except around crust) with a fork. Preheat oven to 425 degrees F (220 degrees C). Bake crust 8 minutes with no toppings. Remove from oven, top as desired. Return to preheated oven, and bake until the cheese is melted and crust is golden brown, about 12 to 15 more minutes. Melt butter in a medium, non-stick saucepan over medium heat. Add cream cheese and garlic powder, stirring with wire whisk until smooth. Add milk, a little at a time, whisking to smooth out lumps. Stir in Parmesan, pepper and parsley. Remove from heat when sauce reaches desired consistency. Sauce will thicken rapidly, thin with milk if cooked too long. 1. Make dough & alfredo sauce according to directions. Pre-bake crust 8 minutes. 2. Top dough with several tablespoons of the alfredo sauce, spreading evenly. 3. 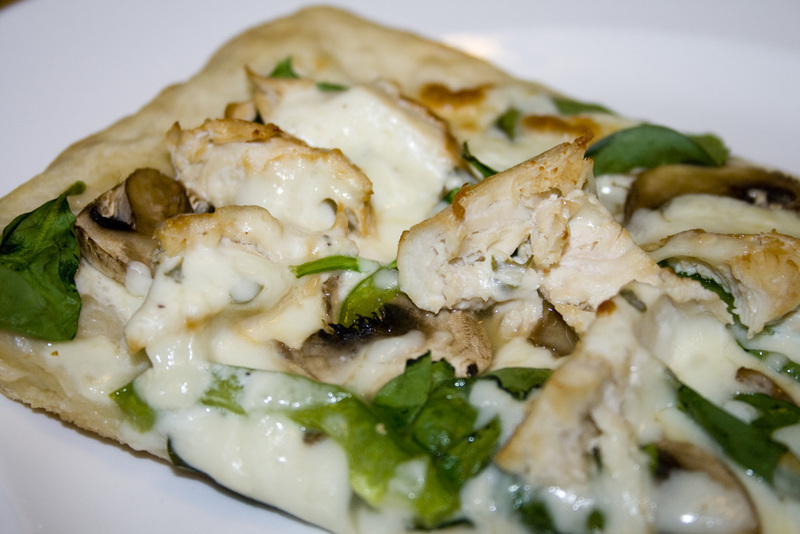 Sprinkle with 1 1/2 cups shredded mozzarella, fresh baby spinach, fresh mushrooms, thinly sliced green peppers & grilled chicken (you can use pieces of a rotisserie chicken if you don’t want to grill your own). Drizzle a couple more tablespoons alfredo sauce and then sprinkle with more mozzarella. 4. Bake for 12-15 minutes until crust is slightly golden and cheese is bubbly. If desired, switch oven to broil for a minute or two (watch carefully!) before removing and serving.